The format again for the clinic will be day 1 is a free expo and show. Vendors will be present with equipment to view and demo on day 1. The Big Barn will be available for coffee and rolls sponsored UP Fabrication and will have display space for brochures and vendor information. The parking lot across the road from the trail head will be for parking and will have all of the equipment displays and demonstrations. 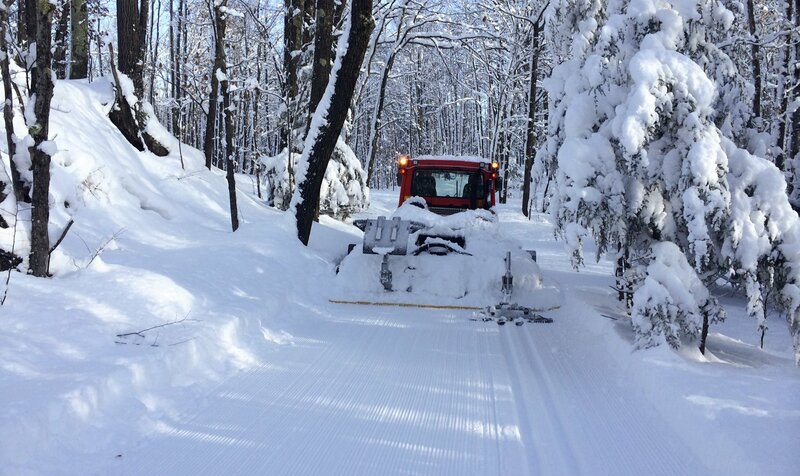 The ski trails across the road will be available for testing equipment. This day will be a great way to just show up from 10- 3 and check out the grooming equipment and visit with the reps. Lunch available on premise by concessionaire for a fee. Day 2 will be here in the Groomer barn at ABR from 9-12 will include all indoor lectures, discussions and forums. The price includes rolls and coffee. Discussions topics are listed below. Evening Meal/Social Hour Wednesday night Jan 23rd. We will be meeting at the Ole Suffolk Ale House at 5 PM in the banquet room for the groomers to hang out and compare ideas, Dinner is available at 6:00 PM. The dinner will be paid per person and is not included in the seminar fees. They have excellent food and will featuring some of their specials for the groomers such as Pork Tenderloins, Lasagna or stuffed Chicken Breast. Book your lodging from the list on www.abrski.com and ask for clinic discount. Review of cooling, steering and wiring modifications to make your snowmobile work better for grooming. Bring your used equipment that you have for sale or a photo and ad to post on the FOR SALE board at the clinic!